(CNN) -- Few people in history deserve sole credit for changing the fate of an entire nation. One of them is Mao Tse-tung, the man who rose from the peasantry to become the pre-eminent revolutionary theorist, political leader and statesman of Communist China. Mao's influence endured more than 40 years from the Long March of the 1930s, through the Red Army's victory in 1949, until his death in 1976 at age 83. He remained chairman of the party to the end. Since Mao's death, however, history has not been kind to his memory. The grip that Maoism -- Mao's philosophy of socialism -- had on decision-making and opinion-molding loosened after 1976. The official version of Mao's career, released in 1981, says his leadership was essentially right until 1957 but from that point forward it was uneven and often off the mark. Mao was born in Shaoshan, a village in Hunan Province. His father was a peasant who had risen above his circumstances to become a prosperous farmer and grain dealer. Mao was a rebellious teen-ager. His father wanted him to be a farmer; Mao wanted more education beyond the village grammar school. Mao left home at age 13 to attend an advanced school in a nearby district and in 1911 arrived in Changsha, the provincial capital, to attend secondary school. He was in his late teens, and it was a time of great tumult. The Qing (Chi'ng) Dynasty had just collapsed and Sun Yat-sen's revolution was under way. Mao joined a provincial unit of the revolutionary army. Although he served only six months, the experience evidently satisfied his boyhood fascination with the exploits of military heroes, among them George Washington and Napoleon, as well as Chinese warriors. Returning to Changsha, Mao couldn't decide what he wanted to study. Such indecision wasn't necessarily a product of youth. Many of his contemporaries were similarly perplexed during those uncertain times. He tried law enforcement, business and history before settling on education, graduating from a teachers' training school in 1918. He departed for Beijing to attend the university. Lacking sufficient funds to be a full-time student, he worked as a librarian's assistant for six months and returned to Changsha to teach. In 1920 he married Yang Kaihui, the daughter of a former teacher. China in the 1920s suffered from the same things it had for decades: intractable poverty, widespread government corruption and meddling international influences. It was as a student in Changsha and Beijing that Mao became intrigued by the philosophies of Marx and Lenin and made friends of nascent revolutionaries like himself who saw socialism as an answer to China's problems. By 1920 Mao was principal of a grammar school in Changsha. In his spare time he organized students, merchants and workers to oppose Japan's takeover of Germany's concession in Shandong Province, a condition of the Treaty of Versailles following World War I. The provision was an insult to Chinese sovereignty and helped crystallize anti-imperialist sentiments and thus support for both the socialist and republican causes. In 1921 Mao was Hunan's delegate to the founding meeting in Shanghai of the Chinese Communist Party. In 1923 the Communist International -- the Comintern -- directed the Chinese Communists to work with Sun Yat-sen's Kuomintang (Nationalist Party). The Comintern had promised Sun that if he would ally with the Communists, the Soviet Union would give him military advisers and arms to build a viable army that could reunify the country by overthrowing the warlords, who had seized upon the chaos and taken control of large areas. In 1924 Mao moved to Shanghai with his wife and young sons as a Kuomintang executive. 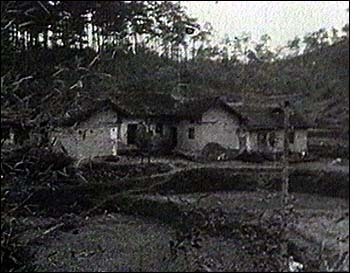 Within a year he was back in Hunan organizing peasant protests, but when he angered the military governor, he fled to Canton, Sun Yat-sen's headquarters. 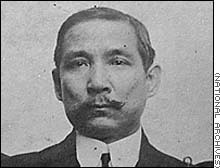 In March 1925 Sun Yat-sen died unexpectedly and the Kuomintang was taken over by Chiang Kai-shek, who solidified his position by marrying Sun's sister-in-law, Soong Mei-ling. One of Chiang's first moves was to expel Communists from leadership posts; by early 1927 the tenuous alliance was broken, and the Communists were retreating to the countryside, where there was growing peasant unrest and thus a potential base of support. In October 1927 Mao led a small group of Hunan peasants to the mountains of Jiangxi Province, where he and other party members created a soviet-style government and began to build a guerrilla army. They gained peasant support in part by redistributing land. It was in Jiangxi the fledgling Red Army developed the tactics that would defeat the Nationalists 22 years later -- establish a peasant base of support in the countryside, encircle the cities and choke off the Nationalist garrisons one by one. In three years the Jiangxi soviet controlled several million people in the countryside, and the Red Army had grown to 200,000 men. It took Chiang's troops three years to defeat the warlords and reunify the country. Then, in the early 1930s, the Kuomintang launched several extermination campaigns against the Communists. It was during this period that the Kuomintang killed Mao's first wife and he married Ho Zizhen. For awhile the Red Army held its own, but in 1934 Chiang unleashed his best-trained units against the Jiangxi enclave, and the Communists were forced to flee. So began the legendary Long March, a 6,000-mile fighting retreat from Jiangxi to the mountain town of Yan'an in remote northern Shaanxi Province. Only a tenth of the 80,000 guerrilla fighters who began the march survived. From this point forward Mao was the undisputed Chinese Communist leader, even through military setbacks and internal political purges. Yan'an was the Communists' stronghold for the next decade. Some true believers cut caves into the cliffs around the town to make primitive living quarters. Following a 1936 visit, American journalist Edgar Snow described them as egalitarian social reformers living simply with peasants. Throughout Mao's life the Chinese government promoted his image and that of his comrades at Yan'an as warm-hearted revolutionaries. Historians now believe Mao conducted brutal power struggles against his rivals during this period. Mao also had the time to write poetry, collect his thoughts and mold Marxist-Leninist theories to fit China's peasant masses -- a brand of socialism that would become known as Maoism. This "Thought of Mao Tse-tung" became required Communist reading. Any deviation from Mao's line was branded as a personal defect, due to that individual's petty bourgeois background. Public confessions followed and potential party leaders were disgraced. While in Yan'an in 1939 Mao divorced his second wife and married Jiang Qing, a well-known movie actress. Jiang would play a central role in the Cultural Revolution of the mid-1960s. When Japan invaded China in 1937, the Nationalists and Communists renewed their alliance to fight a common enemy, encouraged by republican factions and the Comintern, respectively. Mao's areas of control grew to cover nearly 100 million people. The Red Army expanded to between 500,000 and 1 million troops. Within a year following Japan's surrender, however, the Chinese were again engaged in civil war. By October 1949 the Communists had chased the Nationalists off the mainland to the island of Taiwan. 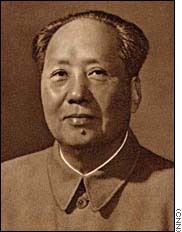 Mao became chairman of the Chinese Communist Party, chief of state of new People's Republic of China, and chairman of the military commission that controlled the People's Liberation Army. Mao and his inner circle of politburo members set out to remake the world's most populous nation socially and economically as quickly as possible. They modeled their initial approach on the Soviet Union's five-year plans for industrial development. Plans and policies were announced, only to be reversed in mid-stream and replaced with new policies and plans. A case in point was Mao's policy of "letting a hundred flowers bloom" in 1956 to enlist support among China's intellectual elite by promoting a free exchange of views. But the exchanges in some cases led to criticism of the Communist Party, and Mao sent the intellectuals to the countryside for "re-education." Then in 1958 Mao launched his Great Leap Forward, which was intended to modernize China's industrial capacity and increase agricultural production. One problem was that decisions were made for purely political, rather than pragmatic, reasons. Coincidental natural disasters and the end of economic aid from the Soviet Union exacerbated the situation. "Mao's faulty economics ended up creating a famine of massive proportions," writes historian Patricia Buckley Ebrey. She concludes from census reports that 30 million people probably died during the famine of 1959-62. Mao lost some influence after the failure of the Great Leap Forward. 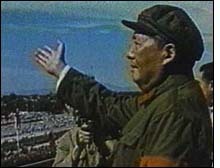 In 1966, however, with his ally Lin Biao controlling the army, Mao launched the Cultural Revolution. He set the People's Liberation Army and students -- the Red Guards -- on witch hunts against his opponents. Millions of Chinese suffered or perished, particularly teachers, writers, artists, party leaders, anyone determined to be "reactionary" in some way. Meanwhile, China's propaganda machine deified Mao and ensured that every citizen had a copy of the Little Red Book, "Quotations from Chairman Mao," whether they could read it or not. 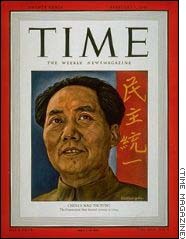 Mao died in 1976 and a strong backlash ensued against the "cult of personality." 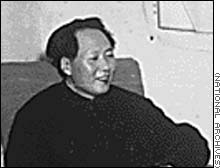 In June 1981 China issued its official judgment of Mao Tse-tung. The statement applauded his leadership and theories through 1957 and then largely blamed him for everything that went wrong during the next two decades.